Like the animated variants visualization, this prototype deals with the problem of representing textual variants, but on a larger scale. Variorum editions attempt to sample or synthesize a given text's entire history, including the ways that text has changed over time. 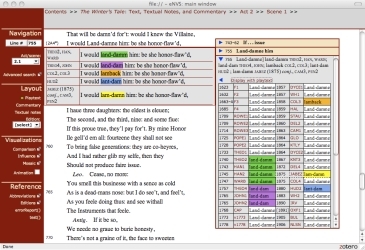 This format was originally used for classical authors like Virgil, whose texts accumulated a great deal of commentary over time, but in the eighteenth century editors began applying the variorum format to modern writers like Milton and Shakespeare. Variorums can best be understood in contrast with critical editions. 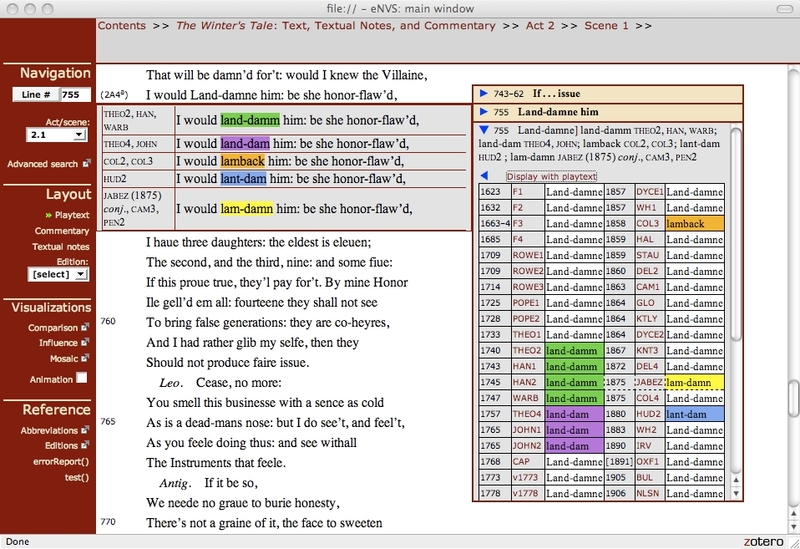 Critical editions usually show a subset of textual variants and emendations that an editor judges most important; variorums try to represent all of them. Presenting that much detailed information in close proximity to a literary text poses a challenge in print, leading to a thicket of notes that fail to do justice to the histories of textual change and contestation they represent. This visualization prototype was originally created for a complete interface I developed for the Electronic New Variorum Shakespeare project. Currently I'm working to separate the textual notes visualizations as stand-alone components that can be used with other kinds of variorum editions. A description of that research can be found in Paul Werstine's article "Past Is Prologue: Electronic New Variorum Shakespeares" in Shakespeare: The Journal of the British Shakespeare Association, vol. 4.3 (2008), pp. 208-20.